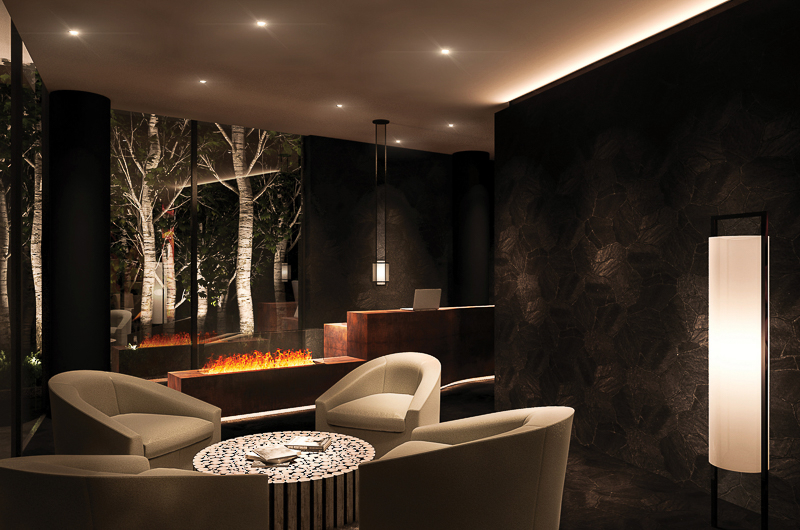 Tellus Niseko provides the ultimate in opulent luxury apartments coupled with high-end concierge service and heart-of-the-action location. Stroll to the lifts or explore the centre of Hirafu Village right outside the door, or call for the private driver who can shuttle you anywhere in the village from morning to night. This is the life! 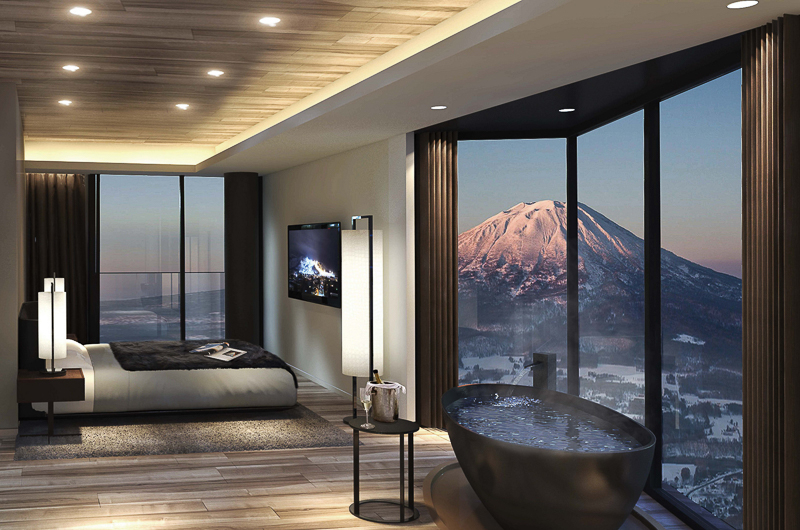 Tellus Niseko is the first of three next-level developments to be unveiled in Niseko. 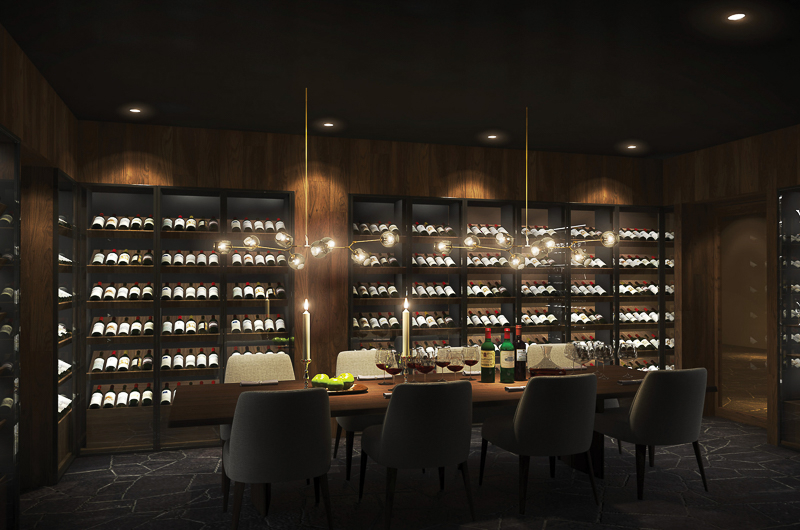 The Tellus brand aims to cater to provide the ultimate luxury environment where guests’ every needs are catered for. 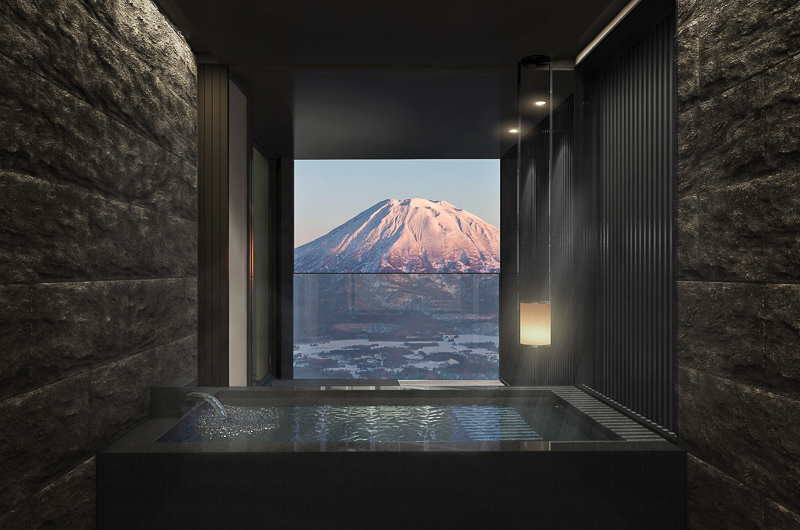 Apart from the outstanding apartments themselves, the standout features of Tellus Niseko are real onsen (hot spring) baths in every apartment – the first condo to offer this in Niseko. 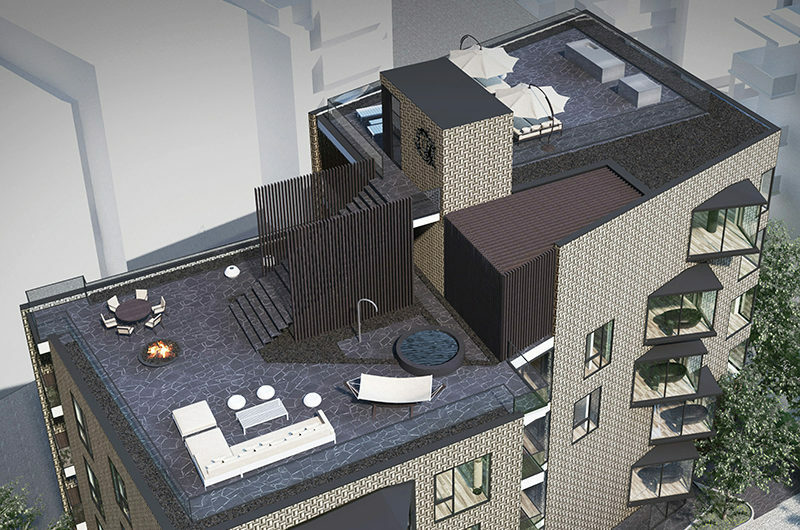 There is also a spectacular full-floor penthouse with rooftop private terrace and outdoor onsen bath. Another stand out feature is the high-end concierge which also includes private chauffeur vehicle service between 7am and 11pm. Whether you want to duck across the village for dinner at a certain restaurant or need to pick up your rental skis, the concierge can take you there in style and comfort. 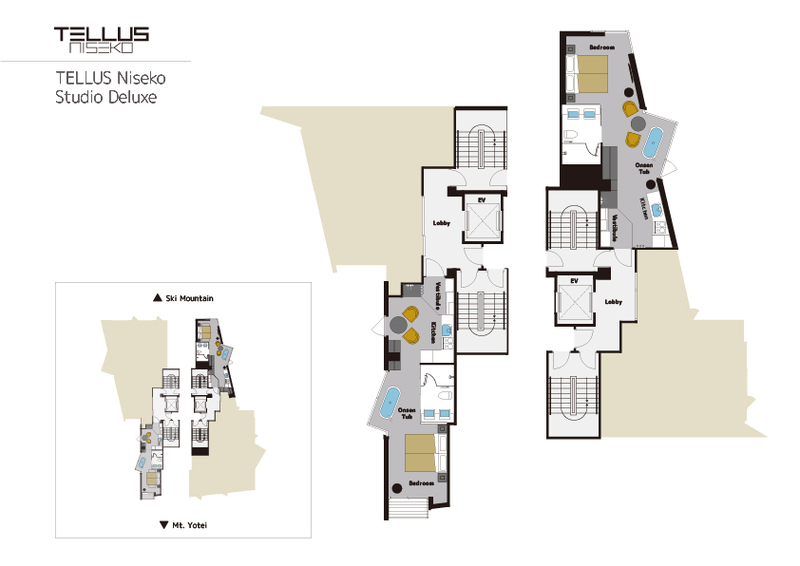 Tellus Niseko houses spectacular onsite F&B options on the street and sub-street levels. La Brace is a fine-dining restaurant headed by a chef with a long-history working in and heading two and three Michelin star restaurants. Cucina is casual restaurant providing a la carte meals for any time of day, while Emporio Bar & Shop offers seafood, Champagne and a takeaway counter for coffee and light snacks. 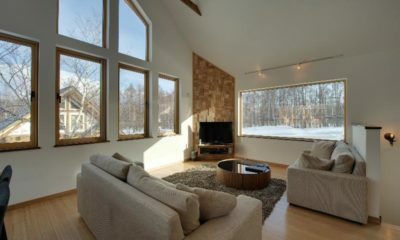 Located on the second and third floors with Mt Yotei and ski hill views. Kitchen, ski storage, aircon, WiFi. Apple TV with streaming service, laundry. 1 en suite, 1 onsen en suite, 1 WC. 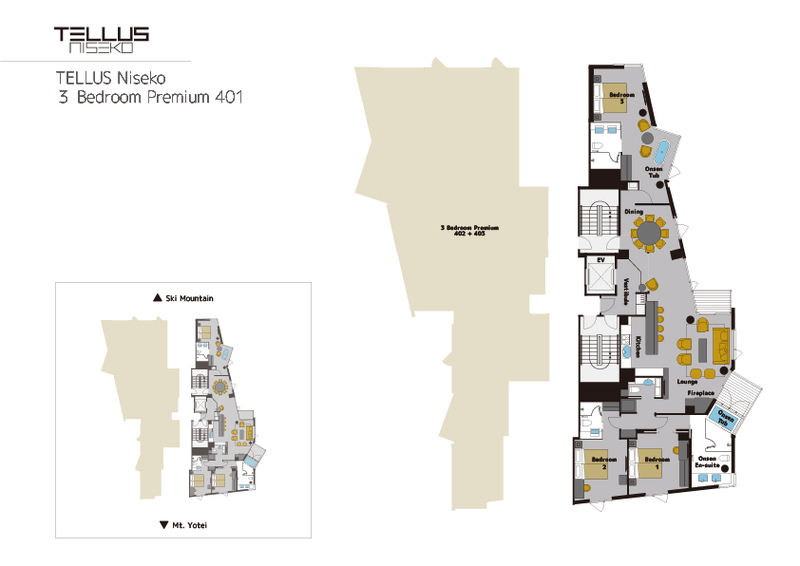 View floorplan. 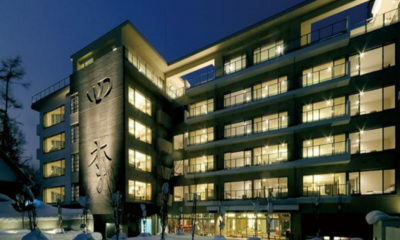 Located on the second and third floors with Mt Yotei OR ski hill views. Kitchen, ski storage, aircon, WiFi. Apple TV with streaming service, laundry. 1 en suite, 1 onsen tub. 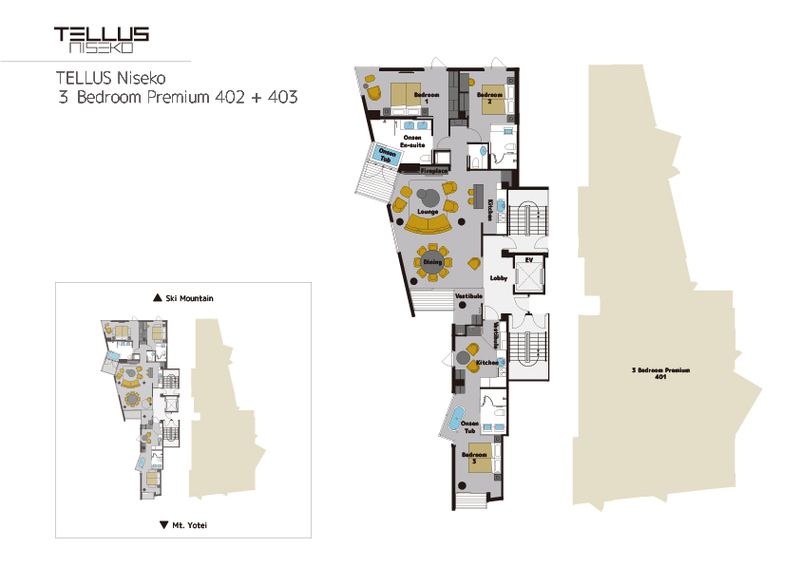 View floorplan. 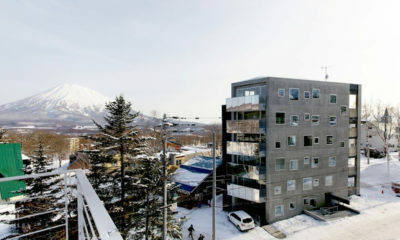 Located on the second and third floors with Mt Yotei and ski hill views. Kitchen, ski storage, aircon, WiFi. Apple TV with streaming service, laundry. 2 en suites, 1 onsen en suite, 1 insen tub, 1 WC. View floorplan. 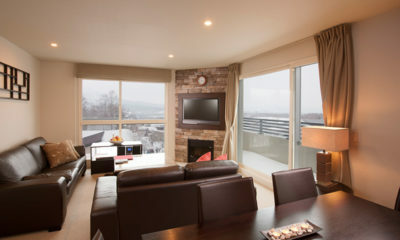 Located on the fourth floor with Mt Yotei and ski hill views. Kitchen, ski storage, aircon, WiFi. Apple TV with streaming service, laundry. 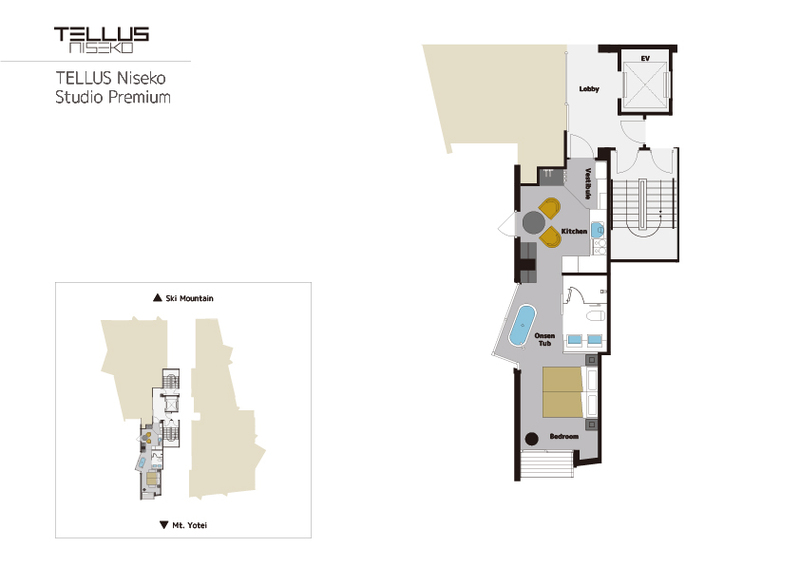 2 en suites, 1 onsen en suite, 1 onsen tub, 1 WC. 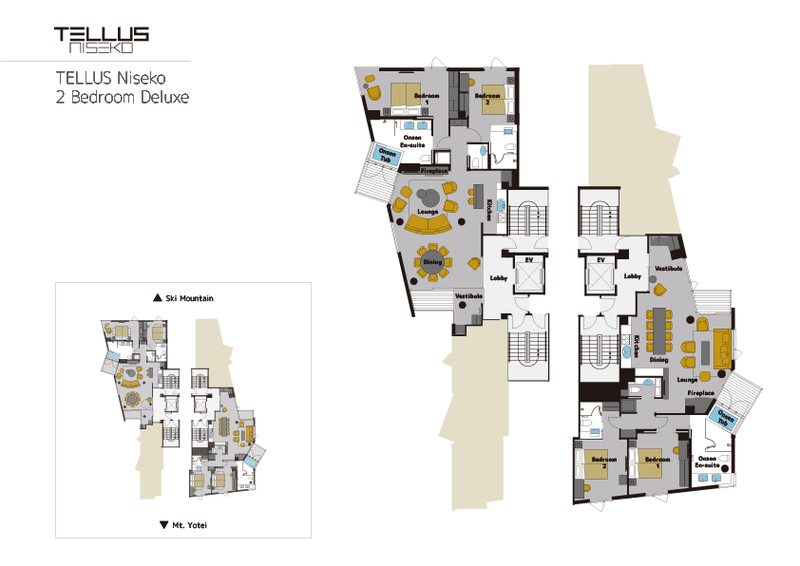 View floorplan. 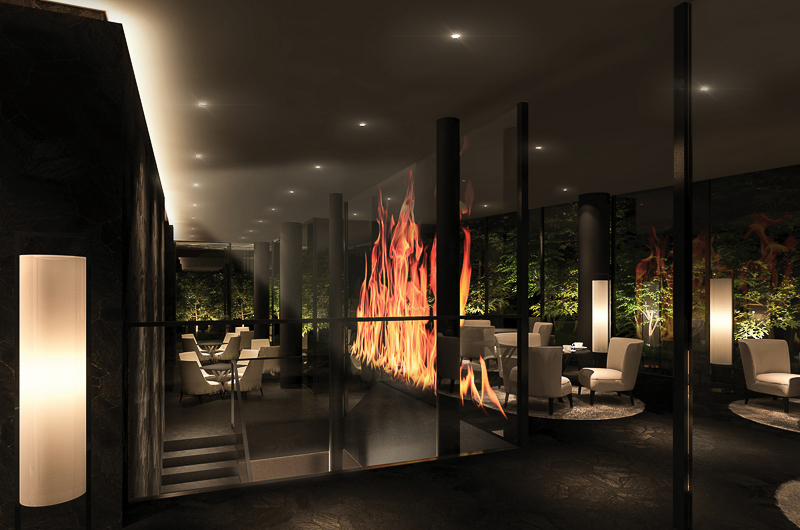 Located on the fourth floor with Mt Yotei and ski hill views. Kitchen, ski storage, aircon, WiFi. Apple TV with streaming service, laundry. 1 en suite, 1 onsen en suite, 1 WC. 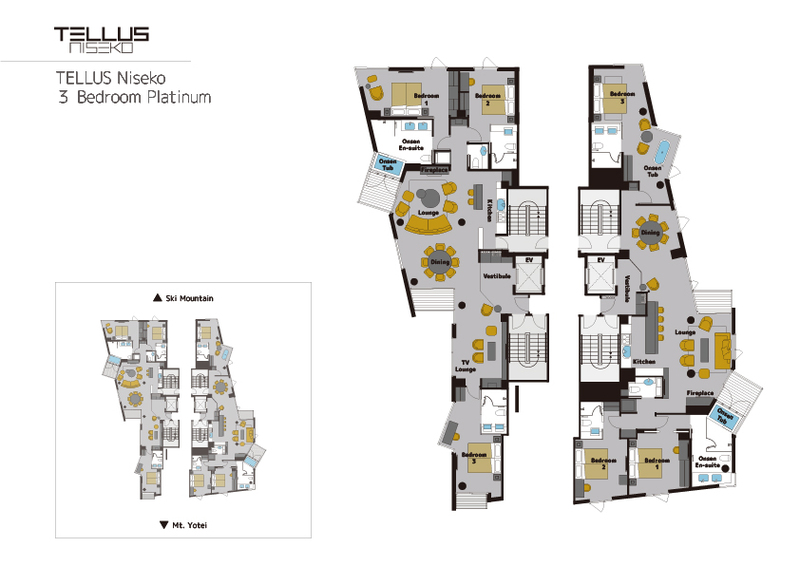 View floorplan. 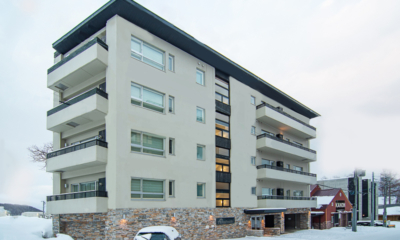 Located on the fourth floor with Mt Yotei views.Kitchen, ski storage, aircon, WiFi. Apple TV with streaming service, laundry. 1 en suite, 1 onsen tub. View floorplan. 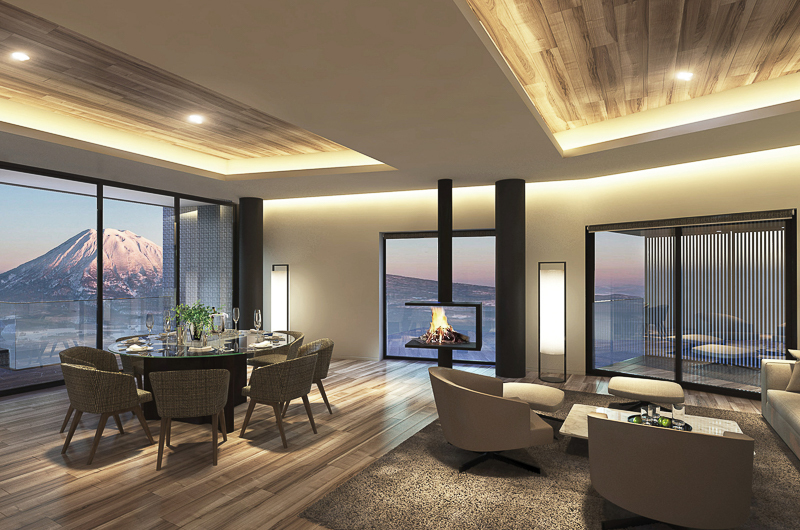 Sub-penthouses located on the fifth floor with Mt Yotei and ski hill views. 2 en suite, 1 onsen en suite, 1 WC. Apartment 501 has an extra onsen tub. 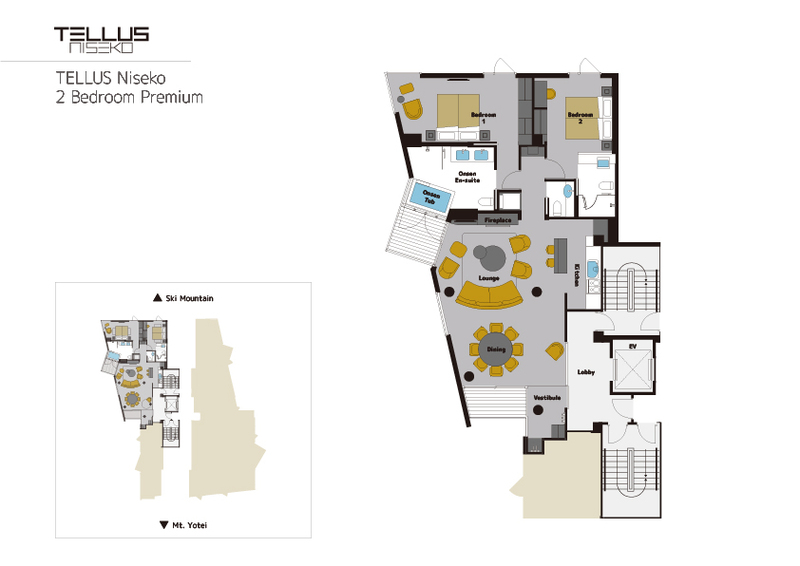 View floorplan. 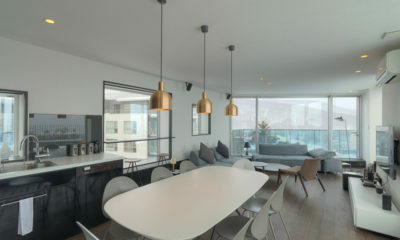 Located on the sixth floor with Mt Yotei and ski hill views. Includes 234m² two-tiered outdoor heated terrace with outdoor lounge, second onsen and kitchen. 2 en suite, 1 onsen en suite (plus outdoor onsen), 1 WC. 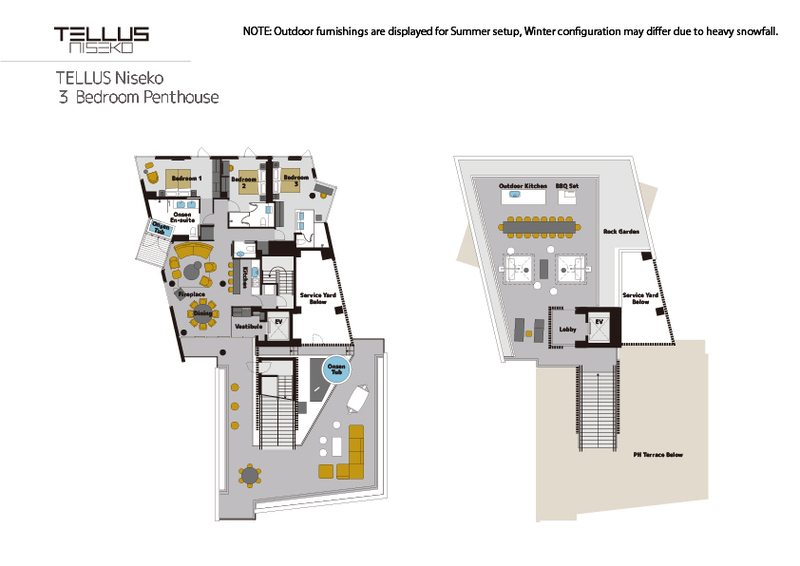 View floorplan. 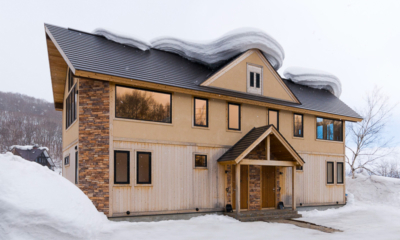 Tellus Niseko is tucked away in a quiet corner on a side street of the side of the bustling Upper Hirafu. While the street itself is quiet you don’t have to walk far before you’re in the heart of the action – just 100m or so to the main street. While Tellus Niseko has private vehicles to take you to the lifts, if you do want to walk it’s about 5 minutes walk to the Ace Family Lift, a high-speed quad that can take experienced skiers further up the mountain. Apart from the high-end F&B in house, there are dozens of restaurants and bars just steps from the door. Izakayas Jam and Akaru are virtually on the doorstep, a few steps on is Mina Mina and Hyatt House with six venues inside. 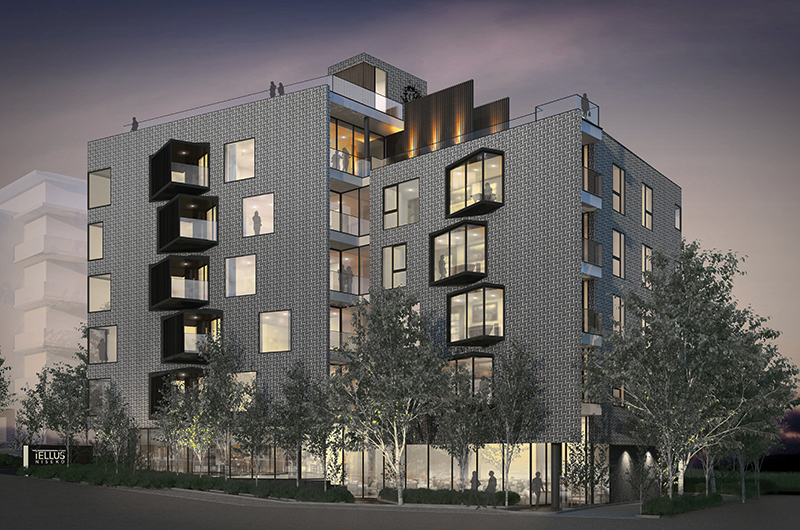 Very excited about staying in this new development which is the talk of the town! The Freshwater is a stylish block of boutique apartments with views of the ski fields and Mt Yotei.